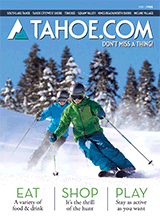 Located in Ski Run Marina, Cabin Fever Gifts is a great place to visit for that perfect Tahoe souvenir or gift. The shop offers a variety of small Tahoe mementos like magnets, key chains and shot glasses as well as larger fun items like the popular Lake Tahoe hand-carved bears. They have a great book selection written by local authors as well as stories based around Lake Tahoe. Another entertaining aspect to the store is their giant selection of ornaments. They are able to personalize any item desired.